The initial feature of this is the medium density color, it isn’t a blockbuster but then again that’s not our style. Barossa Shiraz is a very different wine compared to McLaren Vale. 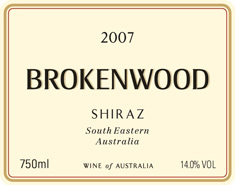 The latter adds dark chocolate/cherry ripe characters while Barossa Shiraz is more noted for spice and earthy notes. These are evident on the nose along with ripe berry fruits. The palate is rich and long. Initial flavors are of fruit pastille with background of vanillin oak. The tannins are quite soft and ripe, nothing firm about this wine.